You may either like MARAUDER or not, but they are definitely worth our respect. They exist in the Greek metal scene from the 90’s and since then they have stayed faithful to what they do and this is no other than playing the music they love which is heavy metal. 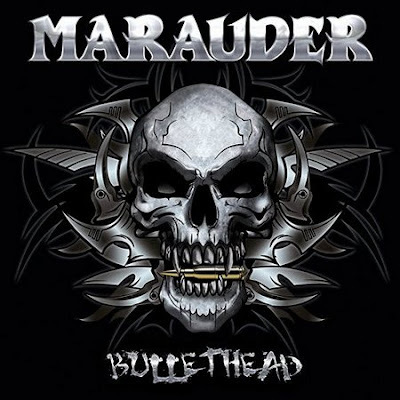 The year is 2016 and 4 years after their previous album MARAUDER are ready to strike with their 6th studio release which has the simple and yet meaningful title “Bullethead”. Through the years MARAUDER might have moved between the epic and traditional heavy metal sound, but they never got astray from their influences which mainly come from the German heavy metal scene. Of course due to their experience and love for what they do they have managed to transform these influences into a recognizable sound. In their new release the band offer us an album that has plenty of traditional and epic metal songs. I would say that they somehow manage in this album to fuse all the elements they have previously presented with their former releases. So you will get here songs that will make you sing along and practice your air guitar skills. Songs that are forged in the anvil of ACCEPT and JUDAS PRIEST. And there are also moments that will make you raise your fist high with compositions that respect the teachings of such bands like MANOWAR, IRON MAIDEN and SABATON. I have stated many times that I love their first album entitled “Sense of Metal”, but I think this one can take the second place in my heart. In any case, this is a heavy album made by veterans of the scene and above all people who have dedicated themselves into heavy metal music and when something is true, then it can’t be bad at all. So, yes you have to check this release out if you consider yourself a heavy metal fan. Αναρτήθηκε από Nick Parastatidis στις 6:45 π.μ.